ww2dbaseWith Captain Benjamin F. Perry in command, light cruiser San Diego had her shakedown and training cruises in Chesapeake Bay on the east coast of the United States. She reached San Diego, California on 16 May 1942 via the Panama Canal and then escorted carrier Saratoga toward the Hawaiian Islands. Reaching the destination just after the Battle of Midway, she joined Hornet's task group in the South Pacific. In Aug 1942, she supported operations in the Solomon Islands area, and witnessed the sinkings of carrier Wasp on 15 Sep and carrier Hornet on 26 Oct after Battle of Santa Cruz Islands. In Nov 1942, San Diego acted as a part of the anti-aircraft screen for carrier Enterprise during the First and the Second Naval Battle of Guadalcanal. In Nov 1943, she escorted carriers Saratoga and Princeton as their aircraft struck Rabaul, then later that month covered the landing operations against Tarawa Atoll in the Gilbert Islands group. In Dec, she escorted the damaged carrier Lexington back to Pearl Harbor for repairs, then continued to sail for San Francisco, California for installation of radar, a Combat Information Center, and new anti-aircraft guns. In Jan 1944, she returned to service as a part of the Fast Carrier Task Force. During the Marshall Islands Campaign, she covered the landings at Majuro and Kwajalein Atolls in late Jan-early Feb 1944 and Eniwetok Atoll in mid- to late-Feb 1944. After receiving additions to her radar at San Francisco, she covered carriers during raids on Wake and Marcus Islands in Jun and the landing operations on Saipan, Guam, and Tinian of the Mariana Islands, where she also participated in the Battle of the Philippine Sea on 19-20 Jun 1944. She went on to screen carriers as their aircraft attacked Japanese positions at the Philippine Islands, Peleliu, Okinawa, Taiwan, Indochina, Southern China, Okinawa, Kyushu, and Iwo Jima until Feb 1945. On 1 Mar, San Diego and other cruisers were temporarily detached from the Fast Carrier Task Force to bombard Okino Daijo Jima, then again on 27-28 Mar to bombard Minami Daito Jima. During the Okinawa Campaign, she continued to protect carriers operating off the Japanese island. She escorted carriers off the Japanese home islands from 10 Jul until the end of the war. On 27 Aug, she was the first major Allied warship to enter Tokyo Bay as she moved in to carry out occupation duties at the Yokosuka Naval Base and the battleship Nagato. 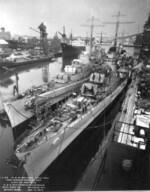 After service during Operation Magic Carpet which brought American servicemen home, she was decommissioned at Bremerton, Washington, United States. 10 Jan 1942 USS San Diego was commissioned into service with Captain Benjamin Perry in command. 19 Mar 1943 Captain Lester Hudson was named the commanding officer of USS San Diego. 13 Jul 1944 Captain Williams Mullen was named the commanding officer of USS San Diego. 30 Aug 1945 USS San Diego arrived at Yokosuka, Japan. 4 Nov 1946 San Diego was decommissioned from service.